I work from home most of the time and much of my work is done with a dog zonked out on my lap. When I get a cranky email from someone or a demand with an unreasonable deadline, my happy, little furball keeps my stress in check. Who can get all red faced and angry when a dog is smiling at you? If you're a pet guardian, you know of which I speak. Dogs are incredible stress reducers and can provide a much needed mental break from the madness of the work day. Doubt the positive effect dogs can have on your nerves? You'll want to read, "Dog Named Woolf Provides Calming Effect for Kids Testifying in Court," a recent article from the Orlando Sentinel which discusses how dogs are used to keep kids at ease during court proceedings. As a dog lover, this is my favorite time of year when it comes to dogs in the workplace. This week is Take Your Pet to Work week, all coming to a glorious end on Friday with Take Your Dog to Work day! If your office doesn't normally allow pets in the workplace, be sure to read "7 Tips to Ensure Your Business is Ready for Take Your Dog to Work Day" and "Win Over Your Boss" to get started. Take Your Dog to Work day can be a really fun opportunity to engage employees, as well. How about having someone snap photos of each employee with their dog? Then, post the pics on your company's Facebook page or upload to your intranet. Or sponsor a hot dog luncheon, with treats for the dogs, too. Tweet the photos out to your Twitter followers or put them in your newsletter to share the fun! Feeling philanthropic? Why not organize a doggie-themed fundraiser with the profits going to your local animal shelter. These are easy things to do to make your employees feel good about the place where they work, and show potential job candidates the fun side of your company! If you want to organize a Take Your Dog to Work day event at your business, download the free Action Pack to get started. And, if you want to learn how dogs can help you become a better business person, be sure to read "How to Succeed in Business by Acting like a Puppy." What do you think? 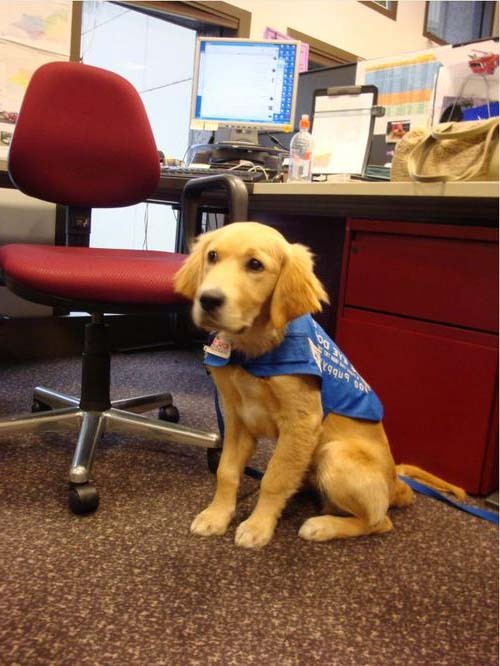 Would you like to see dogs in your office more often? Think dogs in the workplace can affect morale or help co-workers get to know each other better? Love it, Amber! I'm a semi-new dog mom and am fortunate enough to be able to bring my pup to work with me a few days a week. She loooooves being able to come and also conks out on my lap all day. I really enjoy the lightness of having her around, plus the breaks in the day to go out for walks. Our company is very dog-friendly and it really keeps the environment light and fun. Yay! Glad to hear you work somewhere dog-friendly! Having a dog around just changes the whole vibe of the day, doesn't it? And, as you say, taking a break outside for a quick walk can really rejuvenate you. Let us know if your office does something special for Take Your Dog to Work day! I'm definitely a dog lover; I think it's a great idea. Even if it is just a couple days a week; the dog wants to get out of the house too. Thanks for the link. Ghost is a beautiful dog! I think there should be a Take Your Cat to Work Day...but only if you have a nice cat. Or a silly one. I love stopping by here...you always put a smile on my face! Judy! It's always a pleasure! Thanks for stopping by and sharing Toby's story! So, the thunder shirt worked for you? I've heard about them, but would be eager to know your thoughts on effectiveness. P.S. I think you're criteria should apply to people, as well. Regarding the ThunderShirt. It cost $39. But Toby really gets upset with thunder, lightening, and fireworks. He quietly paces the house and pants. Can't be healthy. Well, you know the monsoon season in Arizona...poor thing. So I bought it through Bed, Bath and Beyond. If they don't have your size, then they will place the order and ship it postage free. I put it on him the other night, first thunderstorm...he was definitely calmer and just laid (sp) down under my husband's desk, stilling panting a bit, but relaxed. It is sort of like the "hug machine" created by Temple Grandin or like swaddling a baby. Same principle. That they have to be nice or silly or both? I agree. They were going to try this at our office but a few of us are very allergic to dogs, including myself, so it wasn't possible. Although its a good idea there has to be some consideration for other colleagues. We take DJ to work almost every day, but we own the place, our retail store. He is very well-behaved and we make sure he does not "greet" people until he we know if they want to meet him. The comments are overwhelmingly positive. I think taking your dog to work is a wonderful idea, as long as he/she is well-behaved and there are no issues with the other "human" employees. As a side note, you should not assume that because a business has a dog that you are welcome to bring yours in. This is often not a good idea. Get daily suggestions and guides for earning $1,000s per day ONLINE totally FREE.